Earlier this year a friend of mine was telling me how bad the ground hogs are in his pasture on his farm. He went on to tell me how they are in the barns and all around the old equipment, etc. I got a chance to go out there about a month ago to take a little walk. I saw one hog but was unable to get a shot before he made it back to his hole. The grass was a little high and it was difficult to see the hog and so I figured that I had better wait until they cut the field again. Although I didnt get to shoot any hogs, in the 1 hour that I was there I saw 3 deer, 1 woodchuck, and 1 fox. The fox was within 30 yards. 2 of the 3 deer were very nice bucks. A successful trip in my eyes and I would be back when the field was cut. Well last week, Thursday actually, I stopped by the farm on my way home to see if the field had been cut. They were in the process of bailing it and had most of it already in the wagons. I stopped to talk to the farmer, who Ive known since grade school, and he said that there were a few holes in his field. I had to get home but told him that I would be back soon to help him out with his problem. Not sure how much help I was in reducing the population but I did have my opportunities. The first one I saw was about 110 yards on the far end of the field. I was carrying my Remington Model 700 Classic in .17 Remington. 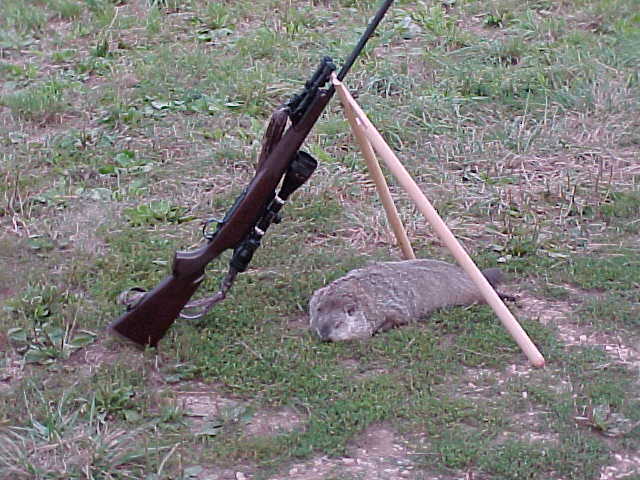 I had a small bipod on the gun but was also carrying my version of Varmint Als bi-fur-pod (shooting sticks). This was a pretty big chuck and was feeding contently in the taller grass. While he was feeding in the grass, I could only see his top half and was aiming at his shoulder. When I shot, he ran to the edge of the woods and stopped. I couldnt figure out what had happened but I definitely missed him. I had enough time to get off a second shot but was not sure why I missed. I didnt shoot at him again and he was able to reach safety in the dense undergrowth of the treeline. I sat there trying to figure out why I had missed him and realized that I had the gun sighted in at 1" high for 100 yards. I must have shot high since I did not see the impact in front of the hog. Being able to spot your hits with the .17 is definitely a bonus. A little disappointed at myself, I headed further down the field. I spotted a big gray hog at the far end of the field. He was about 150 yards away and I got set up with my bi-fur-pod and the gun resting in the sticks. This hog was out grazing and was a good size chuck. I put the cross-hairs on the shoulder and then aimed lower realizing that the point of impact would be high. I squeezed off the shot when I felt solid and watched the action through the scope as the little 25 grain Starke Hollow point rolled this large chuck clean over onto its back. Not even a twitch of the tail could be seen. Below is a picture of my .17 Remington in my bi-fur-pod over the chuck. When I walked up to the hog, I rolled it over to see if there was an exit wound. To my surprise and disappointment, there was a large exit wound just behind the front shoulder on the opposite side. Description of the gun and load. Load: 24.2 grains of IMR 4320 behind a 25 grain Starke RPVB. Remington 7 primers. Scope: Simmons 44 Mag. 4-12 power. Scope base and rings Leupold. Yes I know that the rings are silver and that the base is blued. I bought them from a store going out of business and got them cheap. Cheap was definitely necessary at the time.